The actual energy consumption of buildings in Europe often significantly exceeds the expected energy requirements. This gap in energy performance can arise from construction errors or from differences between the way a building was intended to be used and how it is actually used. An energy management platform could help to reduce this energy gap - and this will be easier thanks to a new and innovative energy reporting platform. A variety of tailored modules to inform users, energy managers and engineers. The modules are explained in more detail here. To provide a marketable, smart platform. 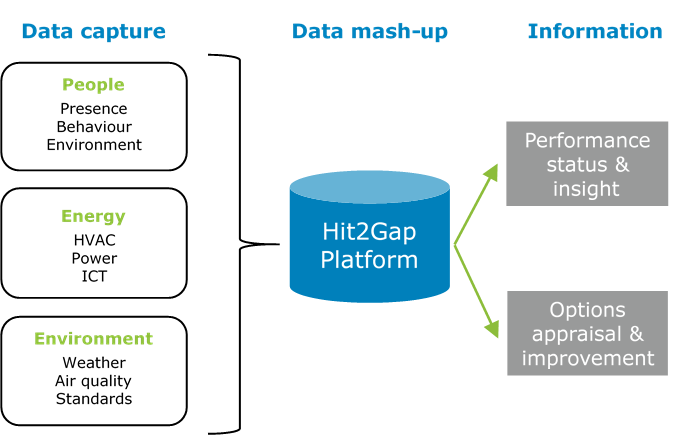 The HIT2GAP partners are working together to create a platform which is both generic and modular, which could be used in a wide variety of buildings and groups of buildings. It will include plug-and-play modules that are designed to inform users about the operational performance of their building(s), based on data collected at building level. The image above shows the platform architecture.